Tomorrow marks the start of another NBA regular season, and this one is the most intriguing season in recent memory. We have never had an offseason that provided more star players changing teams than this past summer. With all these moves taking place, we almost have no idea what teams are legitimate contenders, outside of golden state, of course, because let’s be honest, they’re going to win it all again. The fight for second place should be very compelling, though, as there are four solid teams that are in prime position to take over as the best team in the league if any misfortunes come the Warriors’ way. On top of the title race, there are several very interesting rookies looking to turn their franchises around this season. No matter the outcome, this season is sure to be an interesting one, here are several of the biggest storylines that will make this season so entertaining. In an offseason full of player movement, no player relocation was as much of a spectacle as Kyrie Irving’s departure from Cleveland. The certified sidekick of the Cavaliers seemingly grew tired of playing the second fiddle and decided it was time to make a move, to somewhere that he can unleash his full skill-set and lead a team. This is a perfectly reasonable thought process for most players. But most players aren’t playing with the greatest player of our generation, Lebron James. Playing alongside James in Cleveland, Irving was almost guaranteed a spot in the NBA Finals every single season, which makes his decision to leave this seemingly perfect situation that much more peculiar. Not only did he leave, but he ended up on the Cavs biggest rival in the Eastern Conference, the Boston Celtics. This landing spot makes it inevitable that Irving and Lebron will face off in the playoffs for what is sure to be an absolutely riveting series. As a result of the trade, the Cleveland Cavaliers acquired guard Isaiah Thomas and forward Jae Crowder. These additions to their roster, on top of signing veterans Derrick Rose, Dwayne Wade and Jeff Green has the Cavaliers in position to be an even better team than they were before the trade, as they have great depth. The fight for the top of the eastern conference is going to be a bloodbath. These two teams will be facing off on opening night, which is sure to get the season off to an amazing start. We saw Giannis Antetokounmpo make the leap from promising young player, to legitimate elite superstar last season. Many around the league expect Giannis to soon to become the best player in the NBA, as Lebron James ages. Kevin Durant, arguably the second-best player on the planet, recently admitted that he thinks the Bucks young star may one day become the greatest to ever play the game. That is great praise from a player who is an all-time great in his own right. This may not be the year Giannis takes over as the best player alive, but it may be the year he gets damn close. No one should be surprised if he comes out dominating this year, as he did last year, and wins his first MVP award. With a good team around him, and playing in the weak Eastern conference, Giannis is in perfect position to be in the conversation for the award. The rest of the NBA is praying that he never develops a consistent jump shot, because if he does, he will be absolutely unstoppable, perhaps the most unstoppable player ever. There’s enough ball to go around… right? Last season, the Houston Rockets were among the best teams in the west, as guard James Harden put up an MVP caliber performance, leading the Rockets to a three seed. Coach Mike D’antoni’s scheme was perfect: give Harden the ball every time, surround him with good shooters and let him make magic happen. Harden did just that. They had a top offense in the league, and D’antoni won the coach of the year award. What does the Houston Rockets front office do coming off a season that successful? They trade for one of the greatest point guards of all time, Chris Paul. This move raised eyebrows around the league. Harden was moved to point guard last season, and showed that he’s clearly one of the best in the league in that role. Knowing that, why add another ball-dominant point guard, taking the ball out of your superstar player’s hands? The answer is simple. When you have the opportunity to add an all-time great to your roster, you don’t pass up that opportunity. True superstars seemingly always make it work when they team up with each other, besides Dwight Howard that is. Howard can’t make anything work. There are enough touches to go around for both guards, as Harden is already used to playing the shooting guard position for most of his career, and with a coach as high quality as Mike D’antoni, they should have the perfect scheme in place to take advantage of both players’ talents. The Rockets will surely be must-see TV this year, as they try to dethrone the Golden State Warriors. There was a time when the Philadelphia 76ers slogan, “Trust the Process,” was seen as a joke while the team struggled for several straight years, with no sign of improvement. This process was the idea that a team with no chance of winning a championship, should be as terrible of a team as possible while stacking up on draft picks, in hopes that eventually one of those assets will become a star player. For the first few years the process was a complete failure, as all the players the team drafted were total busts. Then came Joel Embiid. The process finally produced the 76ers with the star they so desperately needed. Along with Embiid, the 76ers now have a multitude of good young players such as Ben Simmons, Dario Saric, Robert Covington, T.J. McConnell and this year’s number one overall pick, Markelle Fultz. With a team full of young talent, and several solid veteran players to complement them, it is now time for the process to produce wins. In the weak Eastern Conference, it is entirely possible that this team can make the playoffs. That is if they can stay healthy, which is a huge “if” with how injury-prone their best players, Embiid and Simmons, are. Even if the team falls short of the playoffs, it will be very interesting to see how well the young nucleus of the team gels together. If all goes well the 76ers are in great position to be contenders in the east for the next decade. Is Showtime Back in L.A.? Life as a Lakers fan has been rough the past four years. Since Kobe Bryant departed, the team’s fan base has been looking for a bright spot, as the team is in full rebuilding mode. After four years of picking high in the draft, the Lakers seem to have finally found two bright spots, Lonzo Ball and Brandon Ingram. On paper, the Lakers rebuild seems to have finally found success, but that depends on the play of Lonzo Ball and Ingram this season. Both players clearly have much to prove, but they are in a great situation to succeed. The Lakers current roster has plenty of talent, and talent that compliments each other well. 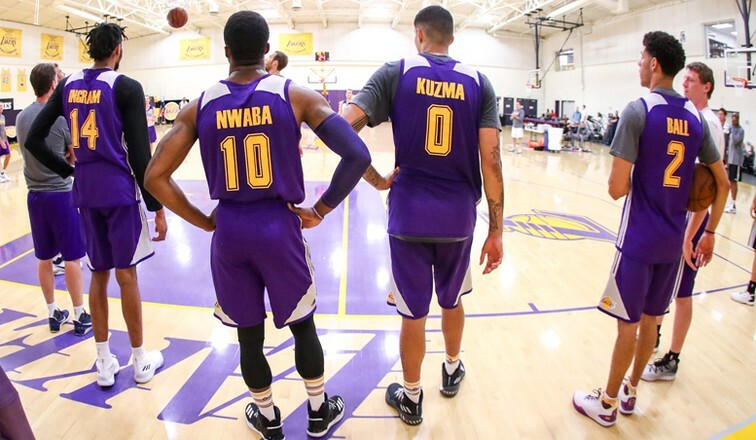 With players like Ball, Kentavious Caldwell- Pope, Brook Lopez, Julius Randle, Ingram, Kyle Kuzma, Jordan Clarkson and Larry Nance Jr., along with a good coach in Luke Walton, the Lakers are in the position to be a respectable team again. If everything were to go right, and Ball and Ingram are the stars everyone thinks they can be, Los Angeles has the potential to compete for the eight seed in the west. Lonzo Ball is such an intriguing talent because he has a unique passing skill that you only see in the all-time greats, like Jason Kidd and Steve Nash. A player like this can do wonders for changing a team’s style of play, as playing with such a gifted passer may show the players around Ball possess far more desire to pass the ball like him. Ball has the potential to provide a complete culture change within that franchise. While it is a possibility, the Lakers really don’t need to make the playoffs for this season to be a success. As long as the young stars show potential, and the team is exciting and respectable, the Lakers fans will finally have a reason to enjoy the season again. Last season, we found out that Russell Westbrook is perfectly capable of leading a team to victory, all on his own. This season we will find out if he can take a lesser role in the offense, coming off his MVP season. 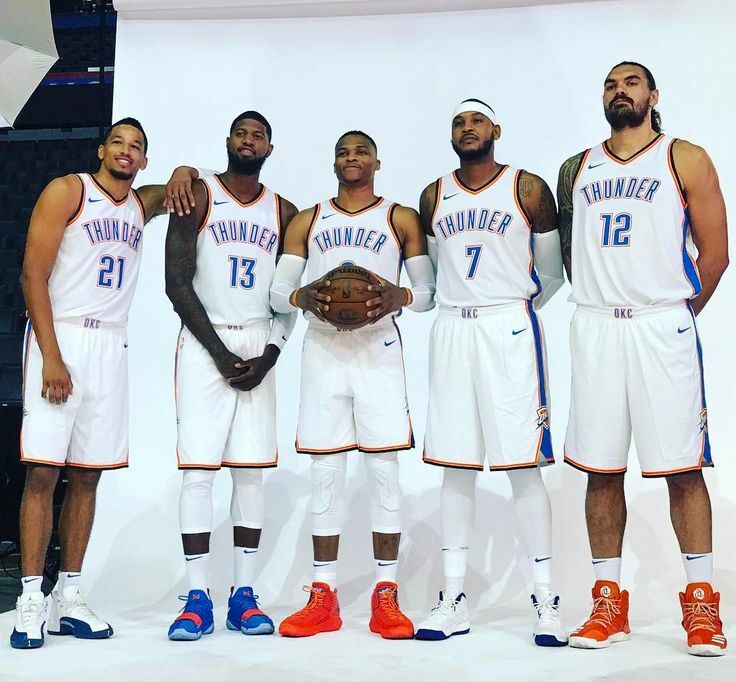 This past summer the Oklahoma City Thunder acquired Paul George ad Carmelo Anthony, to complement Russell Westbrook, and form the league’s newest big three. If everything goes as planned, this team will be a contender that is able to provide Golden State with some competition in the west, but it may not go that smoothly. These three players are all ball-dominant players, who are accustomed to being the star on their teams, leading the offense. It will take all three of them making changes to the way they play, in order for them to mesh together and succeed. This will likely be easy for Paul George, as he is perfectly capable of playing off ball, in a sort of three-and-D role, with time here and there to create his own shot. The main concern is how Carmelo Anthony will adapt to his new situation. Melo is a notorious ball stopper, and however fair it is, known as a selfish player. On paper, this would never work, as Anthony has never shown that he’s willing to play the role of a third scoring option on a team. This may not be the case though. Going back to what I said about Chris Paul and Harden linking up, star players are usually able to make it work, and Carmelo Anthony will likely follow suit. If he wasn’t content with the role as the third option, Anthony would have never gone to OKC in the first place. We have seen from his play in the Olympics, that he is capable of playing alongside other stars at a high level. He will have to channel his inner Olympic Melo, and adapt a new, unselfish game for this team to work. It won’t be easy but I believe that he will be able to accomplish this. If so, the sky is the limit for this team, but they need to address their horrific bench. If they finish the season with the same bench they currently have, they will have trouble in the playoffs, and depth becomes a massive factor in seven game series against the best teams in the league. Posted in Sports and tagged 76ers, celtics, giannis. bucks, kyrie, lebron, nba. lakers, Rockets, thunder. Bookmark.